Celebrate this Independence Day with exciting rides, your favorite Looney Tunes characters, and an incredible fireworks show at Six Flags Fiesta's Patriotic Fireworks Spectacular. Throughout the day, enjoy all of the regular rides and general attractions of the theme park. Families can spend the afternoon together on a tour of Rockville on Motorama Turnpike, flying up three lifts and plummeting down two drops on Bugs' White Water Rapids, and fighting monsters on Scooby-Doo Ghostblasters. Kids will love riding on the backs of exotic creatures on Amerigoround, splashing among rides and attractions at Splashwater Springs water complex, and soaring through the sky jet-style on ZoomJets. Boomerang and Big Bender are just two of the many rides designed to entertain the thrill-seeking guests. 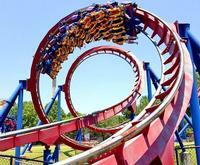 Boomerang sends you on a series of loops and corkscrews, and then does it all again backwards. On Big Bender, twist through the turns, soar through dark tunnels, and plummet down the five-story drop into water. Spend some time with your favorite Looney Tunes friends, too. The characters are always around, waiting to pose for some goofy photos. The Looney Tunes also get your feet tapping to their singing and dancing at Looney Tunes We Got the Beat. And if that didn't fill your musical appetite, visit the Rockville High Theater, where twenty years are celebrated with great music and fashion at the Rockin' at Rockville High show. Grab some dinner before you head over to the fireworks show at any one of the park's delicious restaurants and food stands. Enjoy some of your favorite locations, including Ben & Jerry's, Johnny Rockets, Cold Stone Creamery, and Panda Express. Enjoy a delicious, fresh-roasted ear of corn at Roasted Corn and an old-fashioned turkey leg at Canyon Smokehouse. Then, get your souvenir shopping done at Beach Bum Surf Co., Casa de Looney Tunes, and R.P. Bloomstead's. At the end of the night, head over to the main event – the Patriotic Fireworks Spectacular. Watch the night sky erupt into a fantastic display of colors as you celebrate your nation's independence. This Fourth of July, don't miss out on a great opportunity to spend time with the family while riding exciting coasters, enjoying great musical performances, and watching the incredible fireworks show. Make this Independence Day one you'll be talking about for years.